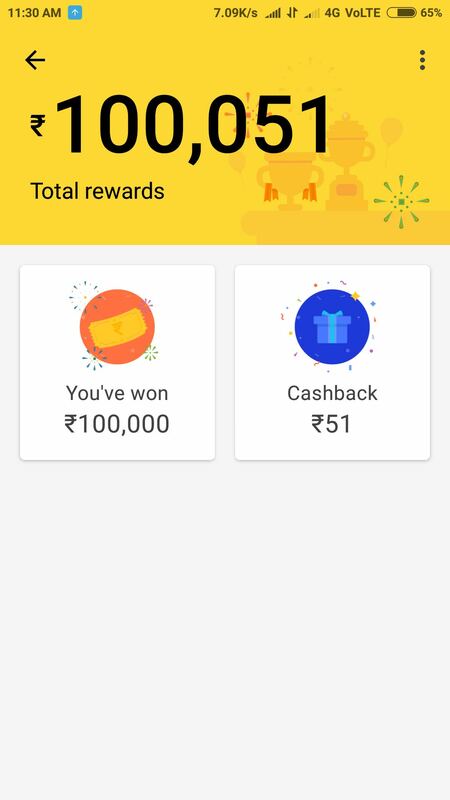 Tez App Lucky Friday Scratch Card Offer – Chance to Win Rs 1 Lakh. Just Send Rs 500 or more your any Tez App user and get a chance to win 1 Lakh directly in your Bank account. Each sender can only earn one reward each per week. For each reward that you earn, you are eligible to win Indian Rupees One Lakh (INR 100,000). So Hurry up and avail this Offer now !! 3) Now Make a Payment of Rs 500 or more to any Tez App users. Note:- Please don’t send me any money. i am already reached my upi limit. 4) Your first eligible transaction each week starting on friday 9am will automatically enter you into the draw that happens the following friday. 5) So Send Today or till 9am (27th Oct) to get Ready for 27th October 2017 Draw. 1) You must successfully send at least Five Hundred Indian Rupees (INR 500) to another Tez User. 2) Payments sent to a non-Tez UPI ID do not qualify for this offer. 3) Each sender can only earn one reward each per week. For each reward that you earn, you are eligible to win Indian Rupees One Lakh (INR 100,000). 4) If you win a prize, your prize money will be deposited into your bank account. As such, you must have a UPI-enabled savings account attached to your Tez account to receive payment from Google. Please make sure that you link your UPI enabled savings account to your Tez account within 45 days of claiming the reward, failing which you may forfeit the reward. 5) Google may need to withhold the applicable taxes imposed on your prizes. 6) As such, when claiming your prize, you must provide your permanent account number or any other document which Google may require for the purposes of complying with the applicable tax requirements. 7) By accepting a prize, you agree that Google may use your name and image for advertising and promotional purposes, without additional consent from or compensation to you. 8) You are only eligible to win one cash prize from the Lucky Fridays Lucky Draw Offer, and if you win, you are not eligible for any other Tez cash prize in the same financial year (1 April to 31 March). 9) Employees, interns, contractors and office-holders, as well as their immediate families (parents, siblings, children, spouses and life partners of each, regardless of where they live), of Google LLC, Inc, its affiliates and subsidiaries, and any representatives or agencies of Google or other persons professionally connected with the offer are not eligible to participate. 10) This offer is not available to residents of the state of Tamil Nadu (as per Tamil Nadu Prize Scheme (Prohibition) Act 1979) and wherever else prohibited by Law. Residents of these states should not participate in this offer. This offer not applicable for tamilnadu y? What is UPI limit ?? How many time we can use upi in a day, in a week, in a month, in a year ???? What is the limit (not in amount but in times) of send or receive money ?? Is there any change after the limit exceed ? What happens if the limit exceeded ?? from Axis pay/phonepe 10 times a day. Only these are confirmed by me as of now. I think bank allow 20 upi txn in a month. This offer is also available for older user or not? nhi milta hai main har week try karta hu.. dhanteras wala me bhi nhi mila tha, diwali wal me bhi nhi mila kuch.. send 50 and get coupon wala me milta bhi hai .. magar isme ek dum nhi milta hai..
Bro itz a type of fake offer because they are not even given 1 rs in Orange card I already scratches more than 12 scratch cards but didn’t get a single penny yet. Blue scratch card is far better than orange cards, got total 300+ rs through that. Orange card is not a Upto 1 lakh card. Its a Flat 1 lakh card. So You will get Rs 0 or direct 1 lakh. And Getting 1 lakh is a Big Task. Friday offer up-to 1lkh tak hona Chahi hi…. Nt only 1 lkh…. I mean don’t show BETTER LUCK NEXT TIME… So People are interested ..and also Tez team….. # Try to new Tez team ? Bro i got 50RS in a single scratch card today so happy, thanks for this app post???? Please contact Tez Team for your issue, They can help regarding 1 lakh prize! I’m trying last 6 weeks in 1 lakh drw. I’m not a Friday winner , but who is the winner of Friday card . Please show the winner details ??? I got a scratch card for this friday draw, but not able to scratch it, though it says it is opened at 10 am today. Do I need to scratch it exactly at 10 am , I did it one hour later at 11 am ?can anyone say? Yes. You can scratch at 11:00am as well.. After 10:00am you can Scratch anytime on same day. Very good app tez app .tommorow I will win 1 lakh on lucky Friday.